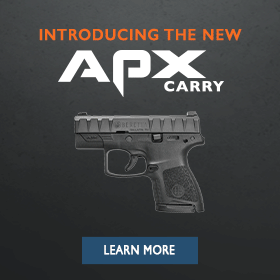 The introduction of the APX model completes the company’s full size pistol portfolio and positions Beretta as the world’s premier small arms manufacturer. Beretta has manufactured semi-automatic pistols since 1915 and is now one of the very few manufacturers to offer full size polymer and metallic framed handguns in both hammer and striker fired operating systems. Beretta elected to debut its new APX striker fired pistol at the upcoming IDEX Show (International Defence Exhibition & Conference) in Abu Dhabi because it is one of the most important shows for the international defense sector. “With the show opening February 22, IDEX is one of the first venues where defense contractors present their wares to worldwide military customers and Beretta felt this was the ideal environment to present the international offering of its APX pistol,” stated Carlo Ferlito, General Manager of Beretta and Beretta Defense Technologies (BDT) Vice President. Designed specifically for military and law enforcement operators, the APX has been put through extensive testing and evaluation at the professional end-user level.